Hooting Owl Lodge Fresh tracks ,great snow, new friends along with affordable accommodation and fantastic hospitality . Imagine waking up looking out the window with the snow falling and having Mt Yotei or the beautiful silver birch forest as a back drop all of this is before you get out of your super comfortable bed. Once you are ready you will be greeted with a western style gourmet breakfast(yes bacon and eggs) with a continental selection, this is one of the most popular features of the lodge with guest raving about how this sets you up for a great morning of riding. After breakfast gear up and get ready for the free first tracks shuttle to Niskeo Village gondola, be one of the lucky ones to get first tracks. After enjoying the day on the mountain come back to the lodge and relax and chat with the other guest in the lounge area a great place to catch up on the days riding and pick up some tips from fellow riders about where to get some secret stashes . Enjoy a drink and some snacks from the honesty bar or feel free to bring your own. 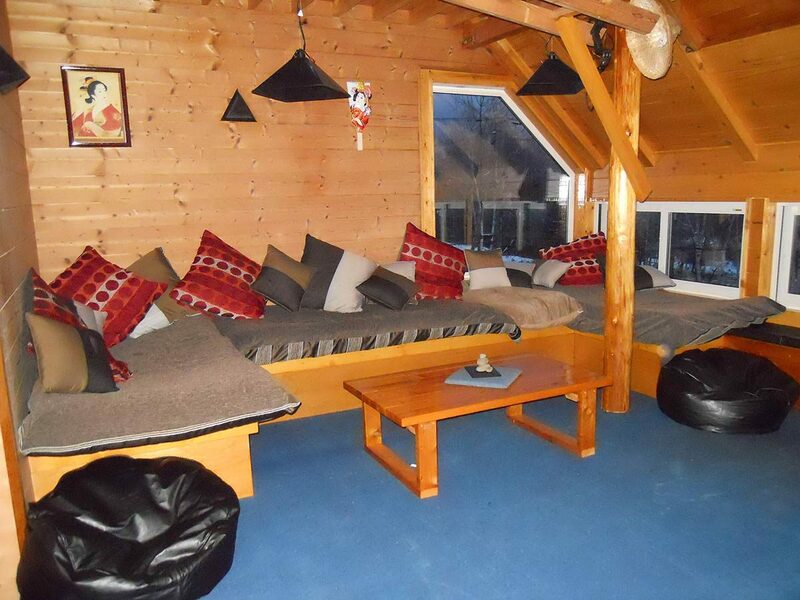 It is the place to relax after a day on the mountain where you will be able to kick back and relax into the mountains of cushions on the huge lounge, play some cards listen to some tunes or watch a movie, a favourite with all of the guests. Don’t feel like venturing out to one of the many restaurants in the Niseko Area not a problem, we have a guest kitchen so you can chef up your own meal and have a relaxed night in . If you do want to get out and try the numerous restaurants in the area there is a bus stop 100 meters from the lodge, buses operate from 8.ooam till 1.oo am . The other option is to call one of the restaurants in Niseko Town for your free pick up and try out some of the local produce and culture away from the tourist hub of Hirafu. If you are looking for a great place to have your next skiing holiday or snowboarding adventure Hooting Owl Lodge Niseko Village Japan is the place to stay it will be your home away from home . Fresh tracks ,great snow, new friends along with affordable accommodation and fantastic hospitality is what you can look forward to. Come and experience the famous deep powder snow of Niseko Japan. Looking for something? Start your search here! Want to advertise on 360niseko? Get in touch to find out more about our custom packages and content plans. © 2017 360niseko | Trademarks are the property of their respective owners. Content uploaded by users or users on behalf of corporations retain the rights to their content.